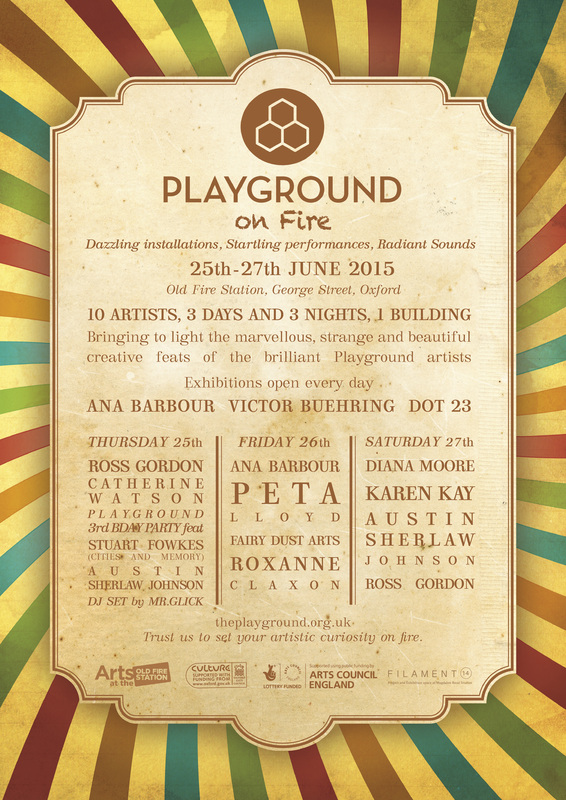 25-27 JUNE: PLAYGROUND ON FIRE! We are now ready to announce the full programme of events that will happen at our 3-day mini-festival Playground on Fire this weekend! Perfectly timed to coincide with Playground’s 3rd birthday, Playground on Fire is an arts festival that brings to light the marvellous, strange and beautiful creative feats of the brilliant Playground artists. More than 10 artists over 3 days and 3 nights will fill the Gallery, the Loft, the Dance Studio and even the Shop Window with dazzling installations, startling performances, radiant Sounds and illuminating talks. And of course you are all invited to Launch the place on Fire with our 3rd year Birthday Party on Thursday at 6.30! Trust us to set your artistic curiosity on fire. Austin Sherlaw-Johnson, Peta Lloyd , Roxanne Claxton, Diana Moore, Karen Kay, Fairy Dust Arts, Ana Barbour and Ross Gordon. 6.30 – 9.30 3rd BIRTHDAY PARTY at the GALLERY!